2 bedrooms, 1.5 bathrooms, sleeps 4 w/Hot Tub! 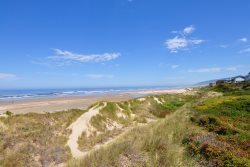 This elegant and unique vacation home on the Florence Oregon Coast has fabulous views of the Siuslaw River and Estuary. The Vista Chalet is located within walking distance of Old Town. The Vista Chalet is elegant and charming. It has been completely remodeled and appointed with all of the modern conveniences and amenities you would expect from a 5 star vacation rental. Enjoy the convenience of walking right out your front door down to the Heart of Old Town with its many Bistros, Restaurants, Galleries and Shops along Bay Street. *Holidays - Minimum 3 Nights Stay! A Valid Credit Card for Security Purposes will be required with final Payment and Check-In. A minimum deposit of $150 is due at time of reservation! Final payment is due 30 days prior to arrival. No Refunds for any cancellations 30 days prior to check-in date! $75 fee applied for all cancellations. Change of Vacation Home or change of dates is considered a cancellation and fee does apply! All applicable County and State Taxes Apply!